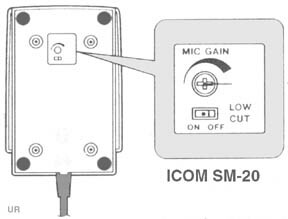 The Icom SM-20 is a unidirectional, electret microphone designed for base station operation with many Icom transceivers. (It cannot be used with non-Icom transceivers since the power is supplied from the connected transceiver). The SM-20 features Up-Down tuning (on compatible Icom transceivers). There is a switch for PTT (push to talk) and also a lock feature. On the bottom of the mic base there is a gain adjustment and a Low Cut switch. This mic is powered from the Icom transceiver. The mic cables terminate to a standard Icom 8 pin mic plug. This mic works with the IC-7800. Copyright 2001-2019, Universal Radio, Inc.